UNIVERSITY PARK, TEXAS (November 28, 2014) Capitalizing on three rushing touchdowns by quarterback Greg Ward Jr., the Houston Cougars rallied in the second half and downed the winless SMU Mustangs by the score of 35-9 at Gerald J. Ford Stadium in Dallas, Texas on Saturday, November 28, 2014. With the win, the Cougars raised their season record to 7-4 going into their final regular season game against Cincinnati. They also raised their conference record to 5-2, which solidified their fourth place standing in the American Athletic Conference. After a quick three-and-out by SMU to stat the game, the Cougars received the ball at the 13:30 mark in the first quarter. On the first play from scrimmage for Houston, Ward, Jr. kept the ball, running it up the left side of the field. He rambled 38 yards, untouched, for the touchdown. Kyle Bullard added he obligatory extra point, to give Houston a quick 7-0 lead. On their second possession, the Cougars drove the ball down the field, but when the drive stalled, had to settle for a 36-yard field goal attempt. Bullard booted the ball wide and SMU took over on their own 20 yard line. After some back and forth ball in the latter part of the first quarter and the early part of the second quarter, neither team could seem to get an offensive advantage on the field. 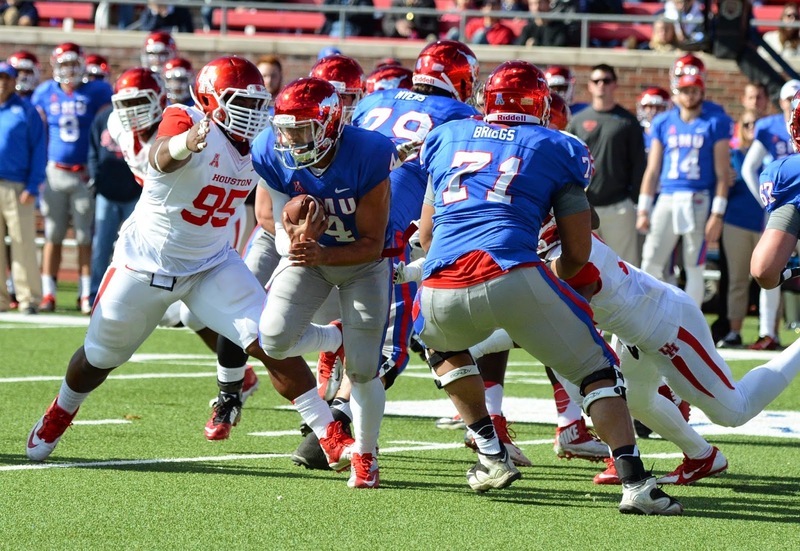 Both SMU and Houston missed field goals; the Cougars from 36 yards and the Mustangs from 38 yards and both teams’ defenses were keeping the opposing offense in check. The Mustangs finally got the scoreboard when Houston was backed up against their own end zone. Ward was scrambling to find a receiver and was called for intentional grounding, giving the Mustangs two points for a safety. 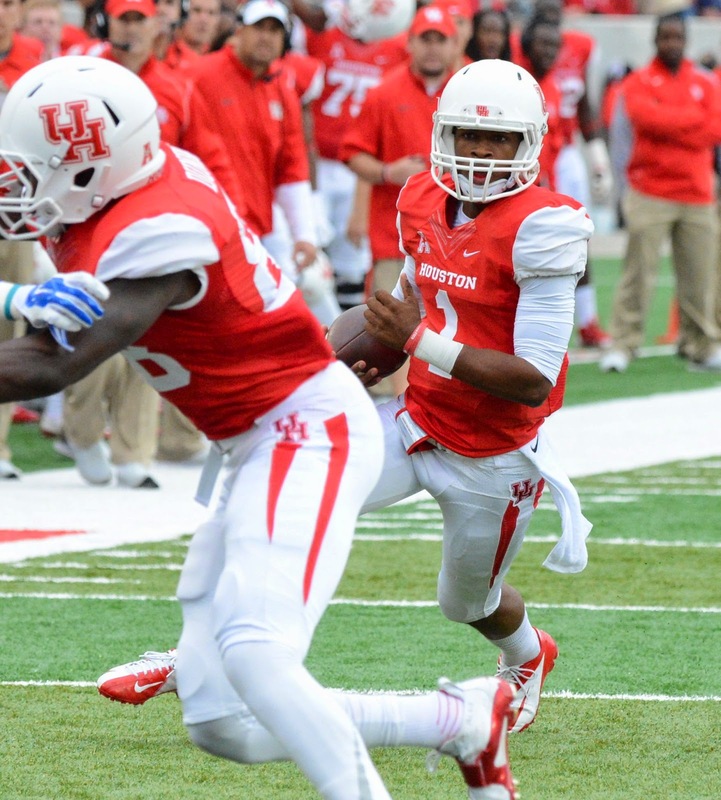 Houston kicked off and gave SMU the ball on their 22-yard line. After two plays, Matt Davis unleashed a 67-yard pass to wide receiver Jeremiah Gaines. Gaines caught the ball, and with two Cougar defender in pursuit, rambled down the left side of the field for the touchdown. Cody Rademacher split the uprights to give the Mustangs a 9-7 lead heading into the locker room at halftime. The Cougars received the ball to start the second half and quickly put the offense in motion. 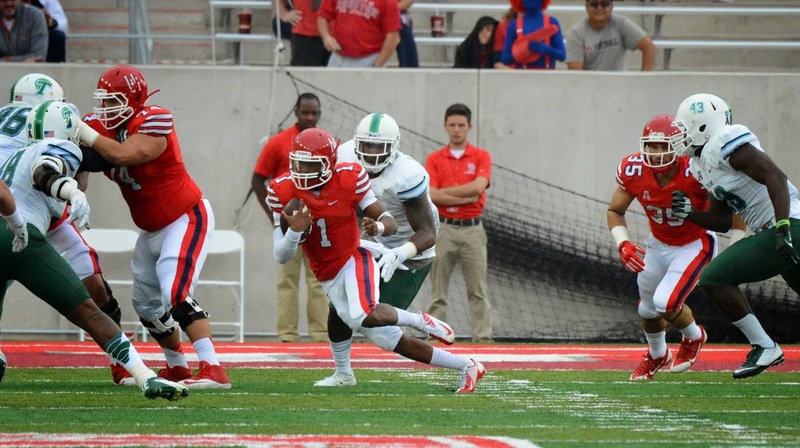 Driving 64 yards in eight plays, Houston gave the ball to running back Kenneth Farrow. He carried the ball the final 11 yards for their Cougars’ second touchdown on the day. Bullard made another extra point, and the Cougars took back the lead, with a score of 14-9, with 11:34 left in the third quarter. Ward, Jr. scored his second touchdown of the day when is carried the ball the final four yards of a 99 yard drive. The touchdown, along with Bullard’s conversion took the score to 21-9 at the third quarter’s 3:10 mark. After the Houston kickoff and a fumble for the Mustangs, the Cougars got the ball back in Mustang territory and began another scoring drive. Three plays later, Farrow carried the ball the final 14 yards into the end zone for the score. The drive lasted 1:04, travelled 23 yards, and gave the Cougars another seven points close out the third quarter with Houston leading SMU 28-9. The 21 points scored by the Cougars in the third quarter was most points scored in the third quarter by Houston all season. With the third quarter rushing touchdown by Farrow, he moved into a tie for ninth place in Houston single season history with 11 rushing touchdowns. The current record is 15, established by Jackie Battle in 2006. With 4:46 remaining in the game, Ward Jr. carried the ball the final five yards for third rushing touchdown of the game to give the Cougars, along with Bullard’s conversion, a 35-9 lead. The drive covered 52 yards in five plays and lasted 2:40. Ward, Jr., who is having a phenomenal rookie season at Houston, rushed for 93 yards on 14 carries and three touchdowns. He also completed 17-of-28 passes for 144 yards and one aerial touchdown. Farrow carried the ball 18 times for 110 yards and two touchdowns. Defensively, Steven Taylor accounted for five solo tackles, while Efrem Loiphant tallied fourth unassisted takedowns. 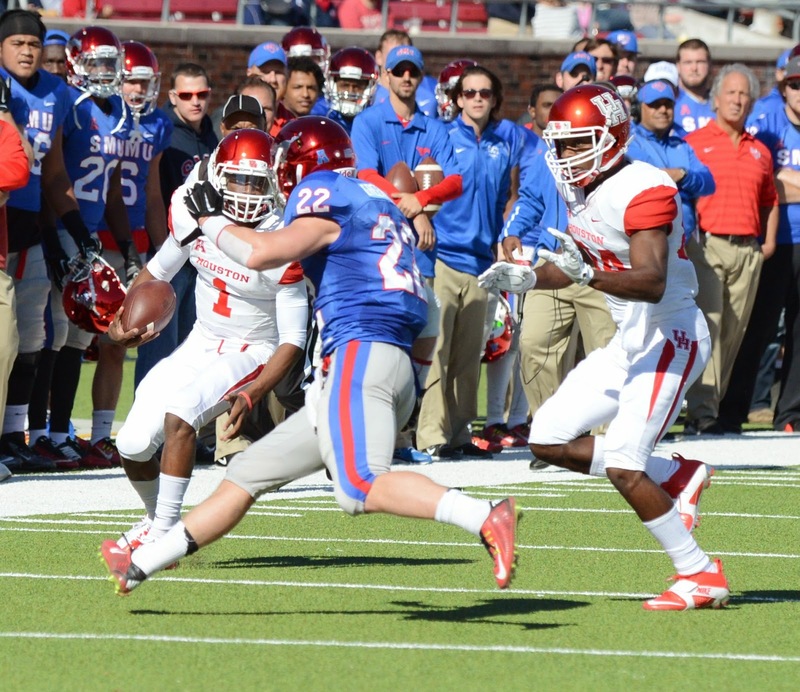 SMU’s Davis carried the ball 20 times for 70 yards, while completing 13-of-27 passes for 145 yards. The Cougars, who were tied for fourth place with East Carolina in the conference standings with a 4-2 record prior to the game. The Pirates (7-3, 4-2 The American) take on Tulsa (2-9, 2-5 The American) in a Saturday evening game in Tulsa, Oklahoma. With the loss, the Mustangs fall to 0-7 in conference, 0-11 for the season and 0-14 in their last 13 games. They close out their season on Saturday, December 6 on the road versus Connecticut. air for the Houston Cougars. HOUSTON, TEXAS (November 22, 2014) The Houston Cougars survived a late comeback by the Tulsa Golden Hurricane and held on for their fourth conference win of the season with a 38-28 win at TDECU Stadium in Houston, Texas on Saturday, November 22, 2014. With the win, the Cougars become bowl-eligible heading into their final two games against SMU and Cincinnati. Houston jumped out to a 14-0 lead in the first quarter on a pair of one-yard runs by running back Kenneth Farrow. Kicker Kyle Bullard, as always, added the extra points for the Cougars to close out the first 15 minutes. Tulsa cut the Cougar lead to seven when quarterback Dane Evans rushed the final three yards of a 41-yard drive for their first touchdown of the game. Carl Salazar added the kicking conversion to close out the first half. In the third quarter, the scoring blitz began with both teams scoring 14 points to take the score to 28-21 with 15 minutes to play. Tulsa scored on a two-yard Zack Langer run at the 6:53 mark. They added an addition touchdown when Evans connected with wide receiver Keyarris Garrett on a 17-yard pass. Salazar again added the conversion kicks. The Cougars scored on a 45-yard Farrow run with 5:28 left in the quarter. They added an additional six points when quarterback Greg Ward Jr. hit Markeith Ambles with a 25-yard pass for the score. Bullard split the uprights on both scores for the conversion points. their support behind the Cougars. Houston went into the fourth quarter with a 28-21 lead; however the Golden Hurricane quickly cut that lead with an Evans one-yard touchdown pass to wide receiver Zach Epps. The score capped a 10 play, 77 yard drive that lasted 4:19. With the touchdown and Salazar’s extra point, a new game emerged with 7:10 remaining in the game. Houston took the ball at their 11 yard line and began a drive to break the tie and eat up the clock. The 89 yard drive resulted in Farrow carrying the ball the final two yards for the touchdown. Bullard added the extra point to give the Cougars a seven point lead with 3:06 left in the game. Tulsa began a final drive in an attempt to tie the score, but with 1:42 left in the game, the Cougars picked off an Evans pass on a fourth-and-one play. Houston ran three plays before opting for a 35-yard field goal by Bullard. With the three points, the Cougars secured the win and sixth victory of the season. Offensive, Farrow rushed for 116 yards on 14 carries and four touchdowns. His four rushing touchdowns ranks his second on the all-time list for a single game. Ryan Jackson rushed for 95 yards on 15 carries with one romp of 56 yards. Ward, who threw for one touchdown and was sacked twice, connected on 17-of-22 passes for 225 yards. He also rushed for 37 yards. On defense, middle linebacker Efrem Oliphant continued his stellar senior year, accounted for 16 tackles for the Cougars; four of the unassisted. Cornerback Howard Wilson tallied 15 tackles, seven solo, while linebacker Steven Taylor added 13. For Tulsa, Evans was 28-of-40 for 258 yards passing, with three interceptions with Lucas catching 14 passes for 97 yards. HOUSTON, TEXAS (November 8, 2014) The Houston Cougars scored 10 points in the final 1:53 of the first half; taking a three-point lead into the locker room at halftime. They could not retain the lead in the second half. 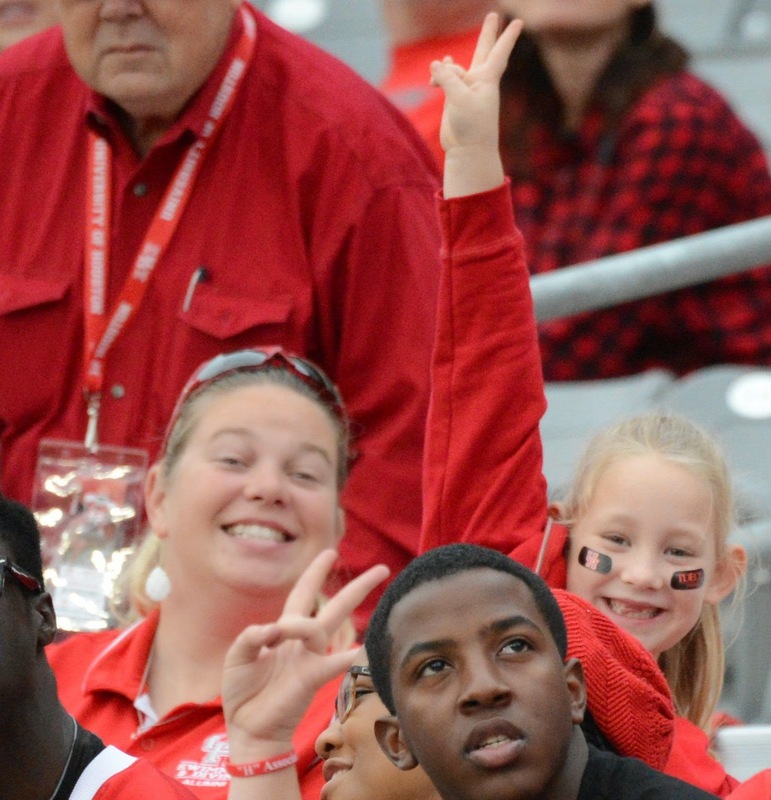 as the Green Wave came back from behind in the second half to down the Cougars by the score of 31-24 at TDECU Stadium in Houston on Saturday, November 8, 2014. With the loss, Houston dropped to 3-2 in the American Athletic Conference, and 5-4 for the season. The Green Wave raised their record to 3-6 and 2-3 in The American. Tulane found the end zone first at 11:19 in the first quarter when Teddy Lee caught a Tanner Lee pass from 12 yards out for the score. Andrew DiRocco added the extra point to give the Green wave an early 7-0 lead. The Cougars followed up with a 13 play, 63 yard drive that lasted 6:03 to even the score at seven-all. 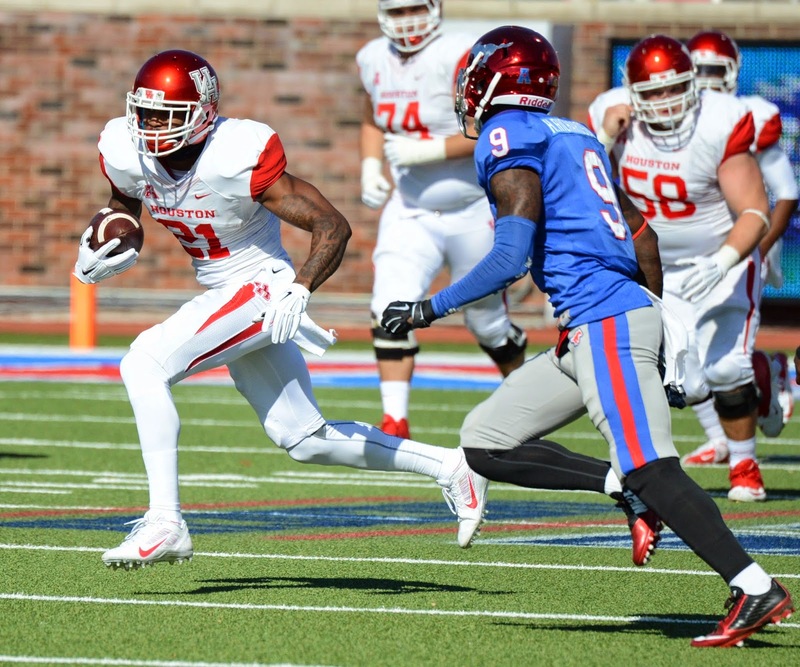 Greg Ward, Jr. connected with Markeith Ambles who rambled 19 yards for the touchdown. Kyle Bullard split the uprights for his 23rd extra point of the season tie the score with 1:36 remaining in the quarter. The Green Wave added a touchdown and extra point early in the second quarter to make the score 14-7. The score remained that way until 1:53 was left in the half. At that point, Tulane had the ball on the Houston 10 yard line on a second down and eight yards to go. Lee hit Teddy Veal with a pass for an eight-yard gain, to the Houston two yard line. However, Houston free safety connected with Veal; forcing a fumble. An alert Adrian McDonald recovered the ball as it rolled into the end zone for the touchdown. Bullard added the conversion to again tie the score. After the kickoff, Tulane drove 40-yard on eight played before giving the ball back to Houston with 1:33 left on the clock. Houston began their drive on their own 47-yard line and advanced to the Tulane 22 yard line before being forced to attempt a field goal. Bullard scored his 14th field goal of the season to give the Cougars their 17-14 lead at the half. Tulane scored a single touchdown and extra point in the third quarter to take a 21-17 lead going into the final 15 minutes of the game. Lee found Leondre James open and tossed the ball nine yards for the score. DiRocco added the extra point for the four point lead. Bullard, who had hit 14 of 16 field goals, with his last previously in the game, went wide right at the 11:29 mark. He then went wide left with 10 second left in the quarter, for his second miss of the game. The sure-footed kicker had only missed two goals previously in 2014. In the fourth quarter, Tulane furthered their lead to 31-17 on a Dontrell Hillard one yard run and an extra point and a field goal by DiRocco. The Cougars cut the Tulane lead to seven with 1:04 left in the game when Greg Ward, Jr. capped a 12 play, 82 yard drive with a nine yard pass to Deontay Greenberry for a touchdown. Bullard added the extra point and Houston prepared to kick off to the Green Wave. Ty Cummings kicked off and booted the ball 12 yards with an onside kick. Houston’s Tyler McCloskey recovered the ball on the Houston 47 yard line to give the Cougars one final chance to win the game. Ward, Jr. drove the ball 48 yards in eight plays, running 1:02 of the clock before he was picked off by Perry Nickerson on the goal line. He returned the ball to the 12-yard line as the clock ran out. Houston head coach Tony Levine expressed his thoughts on the game to the press after the game. Offensively, Ward, Jr. completed 31-of-45 passes for 342 yards. He also rushed for 59 yards and was intercepted three times. Greenberry caught 12 passes for 136 yards and one touchdown. Wayne Beadle and Steven Dunbar each caught six passes for 65 and 64-yards respectively. On defense, Efrem Oliphant continued his stellar season, accounting for 13 tackles and one sack. He now has 96 tackles for the season, along with 20 sacks. The 6-1, senior linebacker stated in the post-game press conference about the defense’s play in the game. Houston will now have a bye-week before their final home game of the season, facing the Tulsa Golden Hurricane on November 22. They close out the season with two games on the road. They will play former Southwest Conference and Conference USA rival SMU on November 28 in Dallas. They will close out the season versus Cincinnati on December 6 in Cincinnati.